Own dtr of SPOTS HOT bred to Automatic Cat + 2019 breeding! Heres is a super nice own dtr of Spots Hot, the sire of the 2016 NCHA Futurity Champion- that is out of the great mare MH San Tule Freckles who won over $100,000! This mare had an injury to her left eye as a baby and has limited vision in it- therefore she was never started. She is very kind natured but is only halter broke. 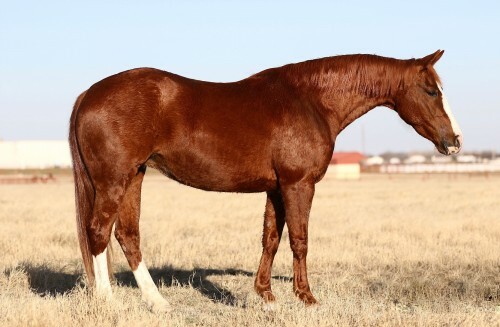 This mare has a beautiful head/neck and is super correct everywhere. This mare was bred 2/11/2018 to Automatic Cat and checked in foal at 2/28/18! She sells with a 2019 breeding to any of our stallions- Hired Gun, Automatic Cat or Metallic Malice! She is 5 panel N/N. Color test is eeAA. She appears to be 100% sound other than her eye. Located in Burkburnett, TX - we can help arrange shipping anywhere!